LED lights are the unrivalled choice of lighting when it comes to reliability in the marine environment. Compared to incandescent bulbs, they consumes less power and produce a more uniform light and at a color temperature that allows for greater penetration underwater. We supply a range of ROV LED lights in 20 watt and 300 watt versions. Operational tests conducted have shown that the 20W unit provides roughly the same amount of light as a 150W incandescent light, while the 300W LEDs are roughly equivalent to 1500W of incandescent light respectively. 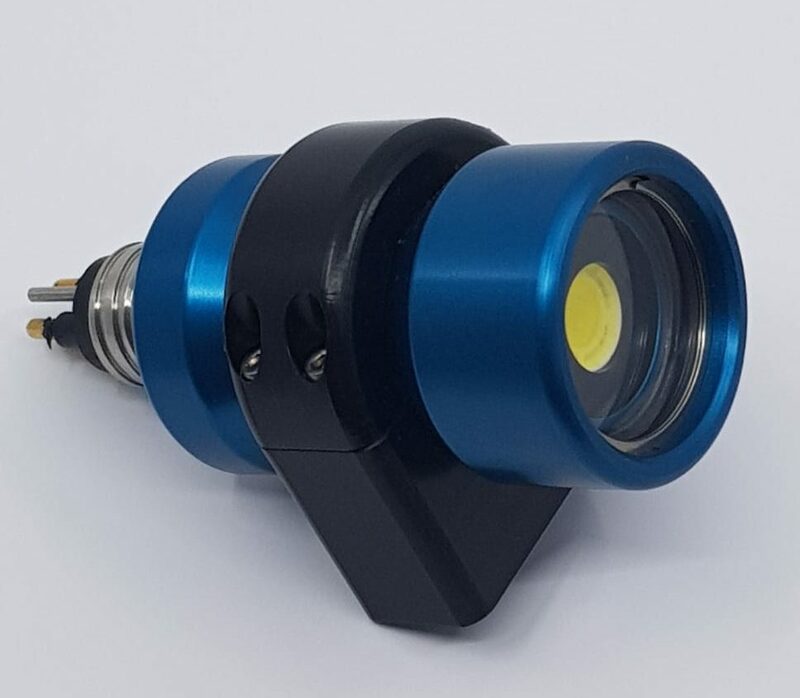 The 20W lights comes with a small power/dimming module to be installed in the ROV pod in place of the dimming unit currently installed. 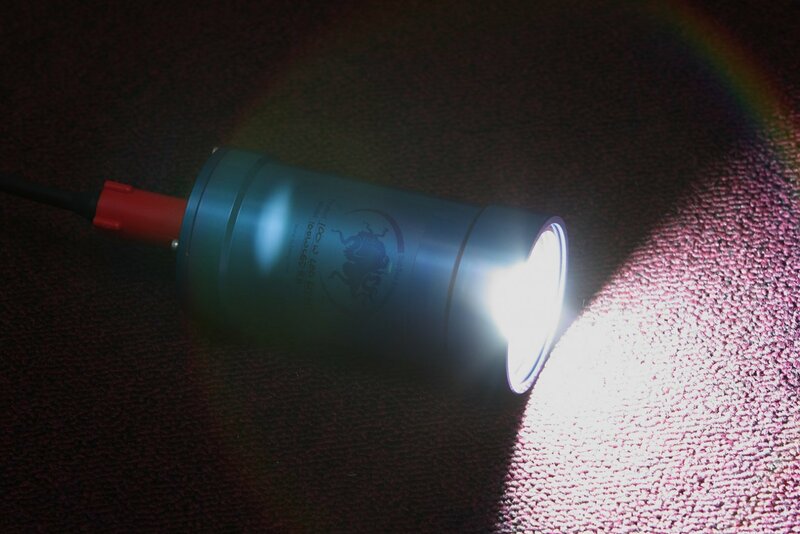 The 300W models have an external power/dimming pod. The pod can be supplied with either 110 or 230VAC and the current dimming signal can be integrated into the pod to allow the LEDlights to be dimmed using existing controls. Alternatively, we can supply a topside control unit which dims up to eight lights as required over a single RS485 circuit. LED lights do not need to be changed on a regular basis as do incandescent bulbs as they are rated for a solid 50,000 hours and as there is no filament, there is nothing to break or burn out. In addition, our larger variants are microprocessor-controlled to prevent over heating. The light will automatically dim to prevent damage to the LED if left on for too long on deck. The video below shows 40 watts of LED light followed by 300 watts of Incandescent light, then back to 40 watts of LED light. Note that there is less backscatter with the LED lights on. 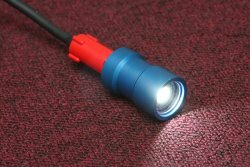 Our Diver LED lights are available in a 20W version, and operational tests have shown that a 20W unit provides the roughly the same amount of light as a 150W incandescent light. The LED lights come with a 1U 19” rack mount unit that includes the dimming circuitry for two lights, along with the necessary equipment for divers’ cameras. We can also supply video amplifiers to be fitted to the topside unit to enhance the video signal. We have a portable version complete with power supplies for both the LED lights and the divers’ cameras for air dive work. Simply install the topside unit into a rack and the divers will have a very reliable light that does not require changing on a regular basis. LED lights have no filament, so there is nothing break or burn out. The LED’s are rated for 50,000 hours. Octopus System International’s dimmable OSI-Power/Dimmer Module is a customised miniature DC-DC converter with an integral Dimming PCB. 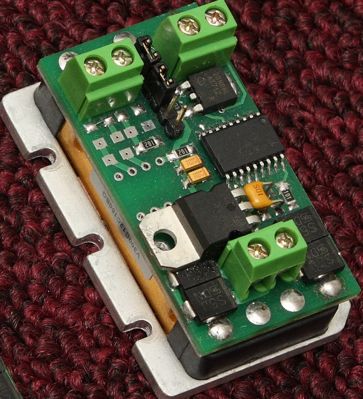 With the addition of a single external capacitor the unit can be used for AC-DC conversion as well. 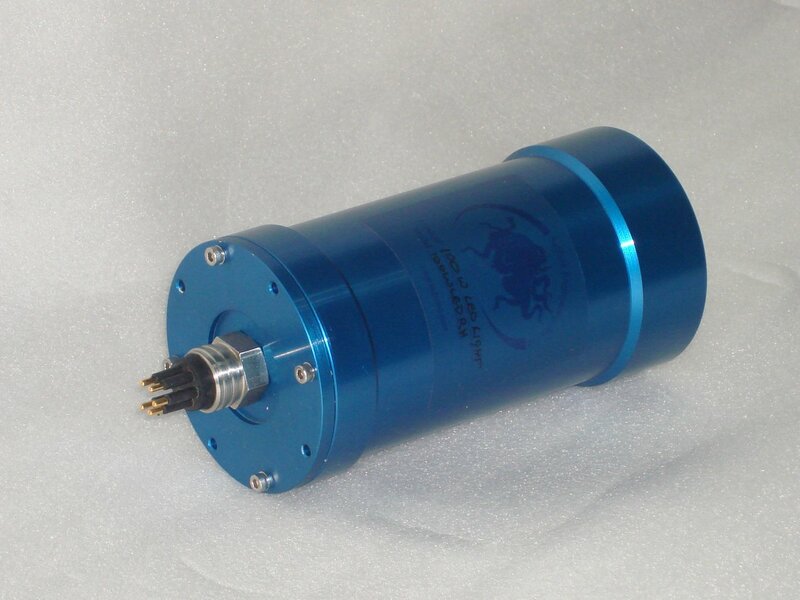 The OSI- Power/Dimmer Module is powered directly from the ROV’s AC or DC supply. The output is 12 volts supplying a possible 6 amps of power. Alternate output voltages are available.